When I first asked Daughter if she fancied going with Wife and I to see a Ukelele Orchestra of Great Britain (UOoGB) concert, her first response was a rather guarded, “How long will it last?” And I knew exactly what she meant. For whilst we had both watched and enjoyed half-a-dozen or so clips from the combo on YouTube, I did wonder if our saturation level for ukulele music would pretty swiftly be reached. Surely no-one, outside of the George Formby Appreciation Society, could really be expected to sit through two hours of the stuff. But it just goes to show how wrong one can be, for the two hours just flew by and the UOoGB, as all good performers should, left the audience (including ourselves) shouting for more. 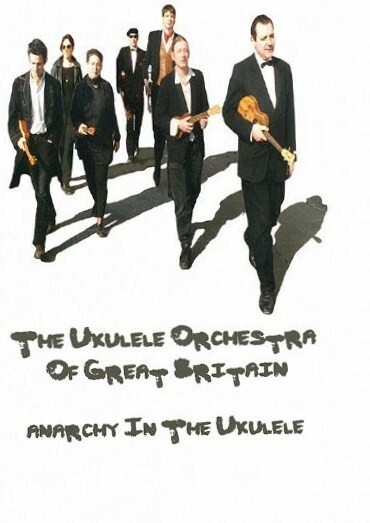 For those of you unfamiliar with UOoGB, they are a collection of eight wonderfully talented musicians, who all just so happen to play the ukulele in one or other of its various forms and sizes. They are also, each and every one of them, very funny with deft lines in self-deprecating humour. Their stock in trade is performing unique and original arrangements for ukulele, of what sounds on the face of it frankly unsuitable material: usually rock standards. Perhaps one or two of their interpretations do not quite hit the mark (I am thinking of Slave to the Rhythm and Smells Like Teen Spirit, here), but many of their renditions are works of inspired genius/madness: take your pick. Silver Machine, Anarchy in the UK, Teenage Dirtbag, Wuthering Heights and Psycho Killer were all given the UOoGB treatment this evening. Daughter did not know most of these songs and some of the associated banter went over her head, but she was familiar with Lady Gaga’s Born This Way, and her wee jaw almost hit her knees when she heard what these eight silly adults on stage had done to one of her fave tunes. Another highlight for her was the group’s arrangement of The Good, The Bad and The Ugly; which is now in danger of replacing Hugo Montenegro’s effort as the definitive cover of Ennio Morricone’s masterpiece. The entertainment was not solely aural and a barnstorming rendition of Johnny Cash’s Orange Blossom Special forded the band an opportunity to indulge in a little physical comedy. There were a clutch of other amusing vigntettes which added to the evening’s fun, but I shall not give the game(s) away. All in all, quite unique entertainment and I heartily advise you to go along, should you find these eight rather eccentric individuals performing at a theatre near you anytime soon.